It’s an obvious observation for anyone who watched the first episode, but it makes sense that Louis would say this because, in his words, people “have every right to expect comedy from a comedian.” All of Louis’ best work is pitched on the thin line between comedy and tragedy, juxtaposing darkness with the light in the proverbial jungle. But for better or worse, Horace And Pete is in the thick of that jungle, and all of those adjectives—funny, awful, sad, confusing, nothing—could reasonably apply to the series depending on whom you ask. Unlike the first episode, “Episode 2” has less of a theatrical structure and instead features a bunch of vignettes about the established characters. Some plotlines are carried over—Sylvia is still suing for her share of the bar so she can sell it, Horace and Alice meet up again to discuss his reasons for kicking Rachel out—but it’s fairly easy to surmise that Horace And Pete is fairly indifferent to serialization. This is a show about a self-perpetuating institution and the attitudes that wander through it. In that regard, “Episode 2” is much more like a dark multi-cam sitcom, with the emphasis more on “situations” and less on theme. It’s much more overtly funny than the “Episode 1,” but also doesn’t quite have as much of a punch. Much of the flimsiness can be attributed to a lack of a strong structural backbone. For all of its roughness, the first episode was really tight and pointed, and much of that has to do with simple structural choices, like the decision to have an intermission so the act breaks feel purposeful, or having a really strong narrative on which to hang all the vignettes. But the second episode suffers from some unevenness in this regard. Sure, the episode is bookended by Horace’s sexual fantasies about Marsha (it opens with Horace in bed with Marsha slinking up to him, and only later do we realize that he’s fantasizing about this; it ends with Horace presumably returning to the fantasy), and you can reasonably connect this with the recurring theme of ignoring truth in favor of comforting lies, but it doesn’t come across all that well. Instead of a narrative, it’s a collection of moments. Plus, the intermission in this episode feels like it’s there because it has to be. These aren’t inherently terrible creative choices, but they definitely pale in comparison to the choices made in the first episode. With that being said, the moment that work here are stellar, especially the one’s set in the actual Horace and Pete’s. 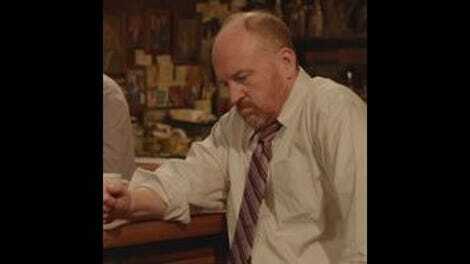 The scene in the beginning with Uncle Pete, Leon, and Kurt discussing the refugee crisis is a great example of how Horace And Pete can mine comedy out of colliding different perspectives, and then driving the conversation in a radically different direction, such as Uncle Pete telling the story of a friend who liberated a concentration camp and thought of Bambi to make himself cry at the site. The scene with Trisha (Maria Dizzia), a Tourettes-afflicted woman that Pete knew when he was in the hospital, at the end is fantastic, and an interesting examination of how entrenched views can become more malleable when face to face with a person with a whole different life experience. (Kurt, Leon, and Uncle Pete may initially approach Trisha with some condescending curiosity, but eventually accept her as one of their own.) It’s also interesting to see Pete be made uncomfortable by a person from his past, especially a person who feels more comfortable with a “public” disorder than him. It’s the scenes with Horace and Sylvia, Alice, and Marsha, the only women in his life, which produce more mixed results. Sylvia comes to let him know she has breast cancer (“I’ll beat it,” she says casually) and that she wants to lean on him for support because if she leans on her children, she’ll have to manage their feelings. But the conversation returns to the bar and how it’s a waste to keep a money-losing business alive just because it’s an institution (“Does every business have to make a profit? Does that have to be the point of everything?” Horace whines). It’s a bit of a minor retread of last week’s discussion, but Falco and C.K. make it shine. On the other hand, the scene with Alice falls flat, not just because it was a variation on the one from last week, but mostly because it’s a very one-note “difficulties of parenting” scene that C.K. does much, much better on Louie. Yet, Horace’s fantasy conversation he has with Marsha has weird electricity to it that could only really exist in a show like Horace And Pete. Though Jessica Lange may not have gotten to do much in the first episode, but here she really embodies the Marsha character, a sad woman who just wants to sit and drink with a nice man who will treat her right. The bits with her and Dennis (Jack Connell), owner of four tire stores, are fairly melancholic as he wants to “treat her right,” and all she wants to do is sit in the bar. By the end, it’s revealed he’s married, to which Marsha bursts out laughing because of course he is. But the Marsha in Horace’s mind is borne entirely out of her sexual relationship with his father; he, and the rest of Horace’s family save for Uncle Pete, sees her entirely as a mistress and nothing more. Horace examining his own weird sexual desires by talking to himself via a strangely sexualized Marsha is the kind of strange, daring stuff that should be in an experimental show like Horace And Pete. It’s not “pushing the envelope” necessarily, but it’s still funny, sad, awful, confusing, and nothing. For my money, that’s a whole lot of something. Another really interesting scene is when Uncle Pete regales the bar with just a humiliating story from Horace’s childhood (he wet himself at a Little League game), but then switches registers when talking about Pete, his son, saying he was a great baseball player and a smart student in high school.